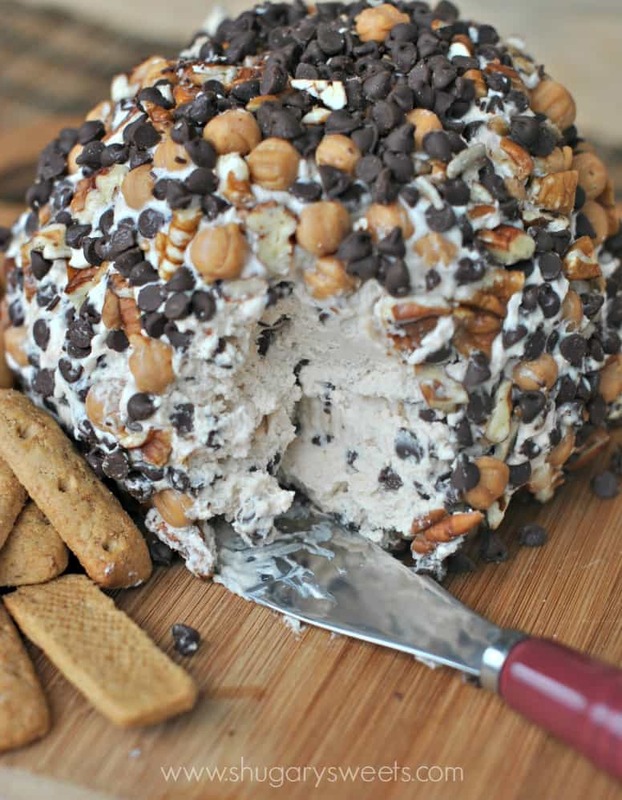 An easy, sweet Turtle Cheeseball recipe with caramel, pecans and chocolate chips! 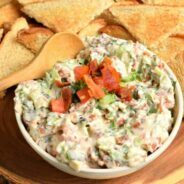 A great dip to serve with apples, animal crackers or grahams. So, in case you don’t live in the US, Thanksgiving is this week. You may be overwhelmed with all our turkey talk. But I’ve got a non holiday recipe for you. Well, non holiday in there is no theme. Except DELICIOUS! Whenever we entertain I love to serve a combination of salty and sweet treats. 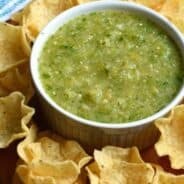 And while guacamole, jalapeno dip, and queso are all delicious choices, sometimes, a sweet dip is equally important. I find myself taking bites of chips, then of this sweet cheeseball, and back to chips again. It really is a vicious cycle! But a delicious, vicious cycle (ha, I love to rhyme)! Today’s recipe is easy to put together. You can make it the day before if you’d like. Mix all your ingredients together. I drop the entire bowl of cheeseball onto a piece of plastic wrap. I wrap the plastic around it and shape it into a cheeseball. Then refrigerate this ball for about an hour. Unwrap and roll it into a bowl filled with your toppings, pressing them into the ball gently. Rewrap your cheeseball into a new piece of plastic wrap. Keep wrapped until ready to serve! 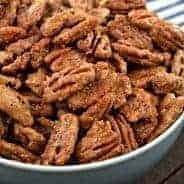 Enjoy this with pretzels, apples, animal crackers and of course it’s great spread onto graham crackers too! In a large bowl, mix cream cheese with butter until fully blended. Add caramel sauce and sugar and beat until combined. Add 1/2 cup mini chocolate chips. Lay a large piece of plastic wrap on counter. Drop cheeseball onto plastic wrap and cover cheeseball completely. Once covered, shape into a ball. Refrigerate for one hour. In a bowl, combine remaining 1/4 cup chocolate chips, pecans and caramel bits. Unwrap cheeseball and roll into bowl of chocolate chip mixture. Press toppings gently into the cheeseball. Rewrap in plastic wrap (a new piece) and refrigerate until ready to serve! ENJOY. If you can't find the Kraft Caramel Bits, you can use Werther's caramels or Kraft Caramels and chop them up! 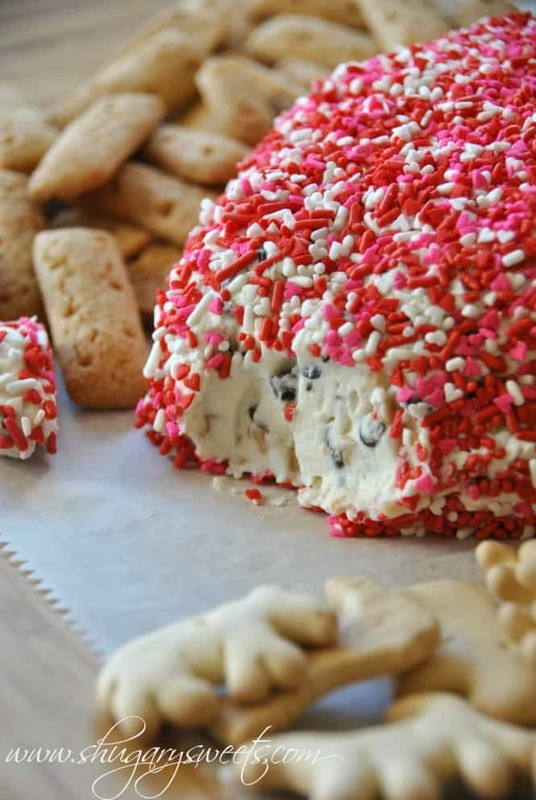 Looking for more “CHEESEBALL” ideas? 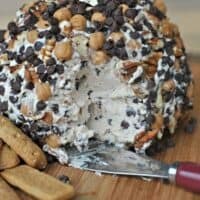 Toffee Chocolate Chip Cheeseball: can use any holiday sprinkles!!! 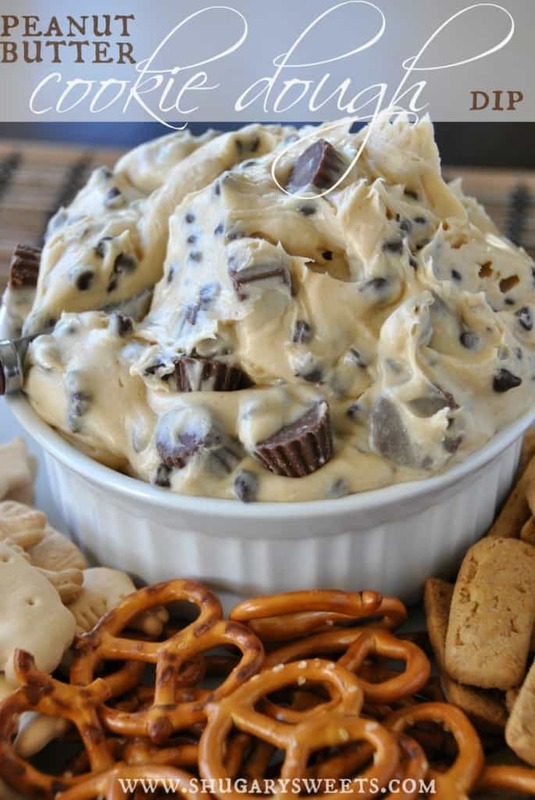 Reese’s Cookie Dough Dip. No description necessary! 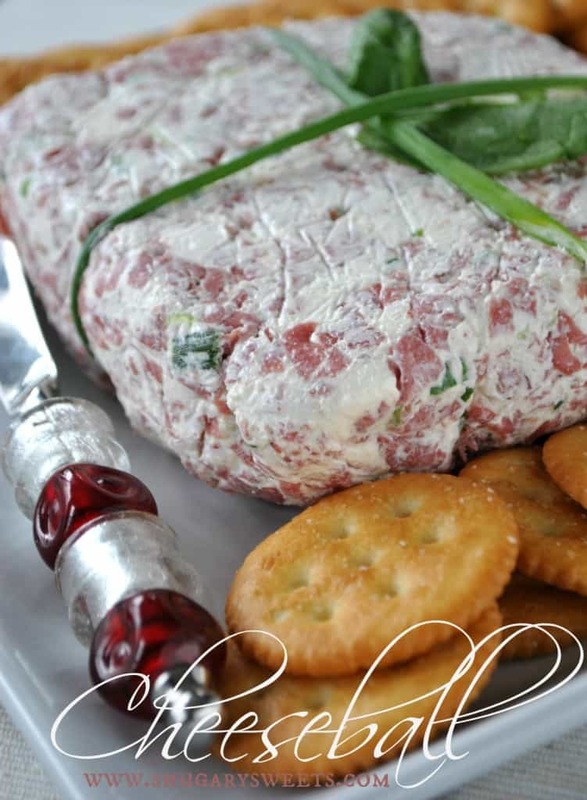 So I am thinking I need to add this to my holiday appetizer list! 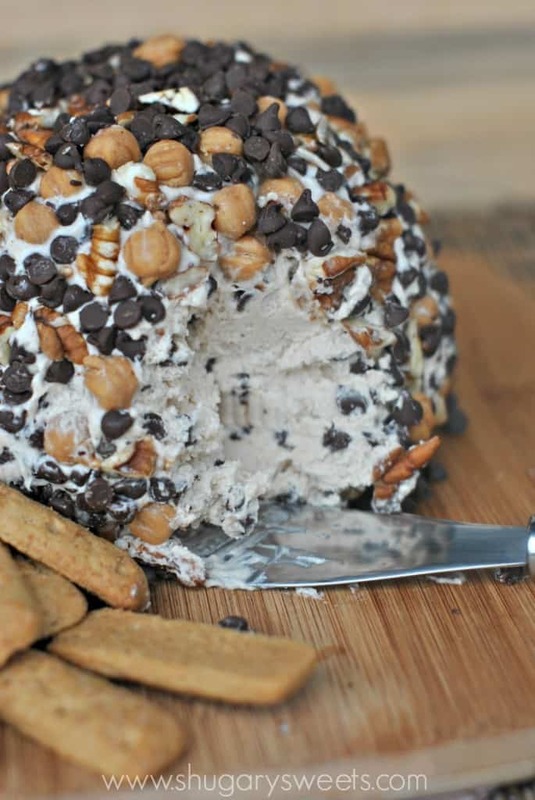 I have never had a sweet cheese ball before and this looks amazing!! Your Turtle Cheeseball recipe sounds amazing! Thanks for sharing all of the recipes! You’re welcome! Glad you are enjoying them Melissa! I saw this on Pinterest and about fell out of my chair. This sounds beyond amazing! I can totally see me dipping my way through the entire thing! Everything about this sounds delicious. Pinning! Thanks for pinning Mary Frances!!! I want this like right now!! What do you suggest to use to dip into the cheese ball? This will be the first one I’ve ever made and served! I’m really excited to make it at my inlaws for new years. graham crackers, apples, nilla wafers, animal crackers, teddy grahams, pretzels….a spoon! I know my family would love to snack on this! So good! I have a sneaking suspicion that I would devour that entire cheese ball before anyone else even had a chance! Yum!!! Thanks Heather! Turtles and cheeseballs were meant to unite! Definitely have to give this a try! I love all the flavors in this. Perfect snack for Thanksgiving. Can’t wait to make this cheeseball for the holidays! But the graham crackers shown in the picture, where can I find this kind? All we seem to have around my neck of the woods are the usual box of rectangles. Thanks for the recipe and the name of the crackers!! Hi Janice, those are graham sticks. I’m not sure which brand makes them! Teddy Grahams would also be a fun “dipper” or Nilla wafers too!! ENJOY! I have never had a cheeseball- I think I need to change that! This would be the recipe to– all that caramel and chocolate and cream cheese… HEAVEN!! Yes. This should be your introduction to cheeseballs 🙂 Have a great week!! soooo….what happens if I eat this entire cheeseball on my own? Will I then turn into a cheeseball as well? This is like the definition of fabulous party food. I love this idea! Thank you Abbie for pinning! I made this for Thanksgiving today. I cannot wait to have my family try it. I doubled the recipe and it made a HUGE batch – I will admit, about 1/4th of it was left at home! 🙂 It is AMAZING! This is absolutely genius! It looks incredible! I have a feeling it would be gone in a snap! This looks gorgeous and sounds delicious! I think I will be adding a sweet cheese ball to our holiday menu this year! Are those hazelnuts I see along with the pecans and chocolate chips? Looks amazing! Thank you for sharing. Making this for Christmas! 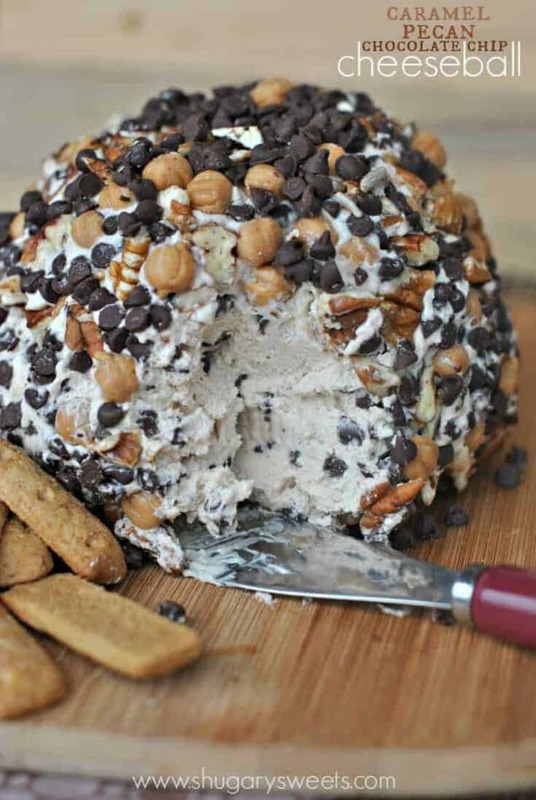 I HAD to pin, save and drool over this cheeseball … then my hubby looked over my should and saw your Peanut Butter Cookie Dip … had to save and pin that recipe too! Now I must share my new finds 🙂 Thank you! I am considering making this but freezing a small ball of hot fudge first, then building the cheese ball around that? So it has a fudgey center. Of course I am considering doing that when (a) I have never even made the basic cheeseball and (b) it’s for a baby shower with dozens of people. May be a recipe for disaster! We’ll see! Oh!! That sounds like a fun idea, be sure to let me know how it turns out!!! I can not seem to get the cheeseball firm. Any suggestions? I had the same problem. Suggestions? i had same problem too! Since I couldn’t get it firm I made it into a dip! It was amazing! I made the Turtle Cheeseball for my all girls weekend fun at the lake and it was a great BIG hit! It did not firm up for me either. I’m going to mix in the topping ingredients and put it in a pretty bowl for dipping. What a bummer, not sure what to suggest! Although, using it as a dip is a great alternative! This will be my first cheeseball. I’m making it for a Thanksgiving app. I really hope I don’t meets it up and that everyone will like it. This was amazing. Definitely needed to put in the fridge to get it to be a little firmer. Delicious. Just delicious. Mine didn’t firm up, but it didn’t matter. The entire thing was eaten, and everyone loved it. I made it for a baby shower and got a lot of compliments. I didn’t find caramel bits, so I improvised. After I put pecans and the mini chocolate chips on the outside, I drizzled some of the caramel sauce over it!! I will be making this again, but will try 1/3 cup butter next time and see if that helps with consistency.